الى الان في الاسواق وعليها اقبااااال كبير جدا من بناتنا ..
منتج مكياج او كما (ادعــــــــــوا) اصحاب (المصلحه)..
والمنتج عباره عن قلم صبغة برأسين كبير وصغير ..
اقلام التلوين يدخل في تركيبها مواد سامه والبنات جالسين يستخدمونها على بشرتهم وحواجبهم .. Experimental, original and simple to use, it has a wide spectrum of more than 168 color tones combined with the special alcohol-based, non permanent ink formula. 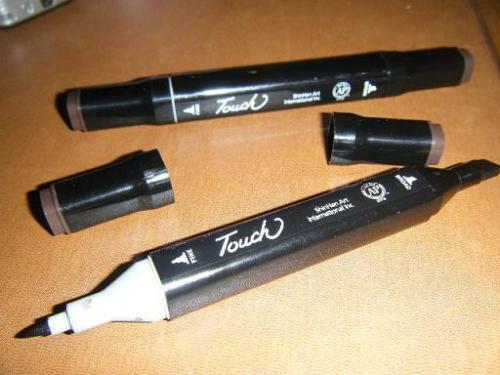 Touch Marker features the special „round edge design“ to stop it rolling off the work surface, avoiding this interruption to your workflow. The „True Color Cap“ clearly identifies the real color of the marker, making it easy to work with the palette. 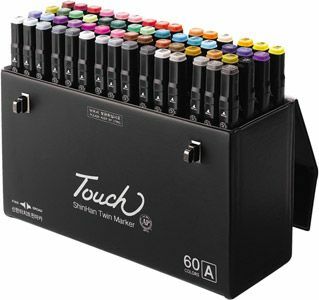 A collection of 48 high quality Shinhan Touch Twin Markers - ideal for designers and illustrators across a wide range of industries. 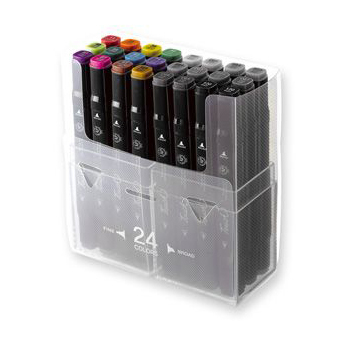 These pens are alcohol-based and non-toxic and are a great value alternative to the more expensive Copic and Tria markers.